Thirty-six militants accused of being part of Islamic State cells in Egypt have received preliminary death sentences for their alleged involvement in the bombing of three churches. A military court has referred the cases of 36 defendants to the nation's Grand Mufti with the recommendation that they be put to death. The defendants were convicted of being involved in four different acts of terror that occurred in 2016 and 2017, including the bombings of two churches on Palm Sunday last year, and an attack on a police checkpoint. They're also accused of being part of the Islamic State cells in Cairo and Qena. The cases were originally referred to the military court by Egypt's Attorney General Nabil Sadek. 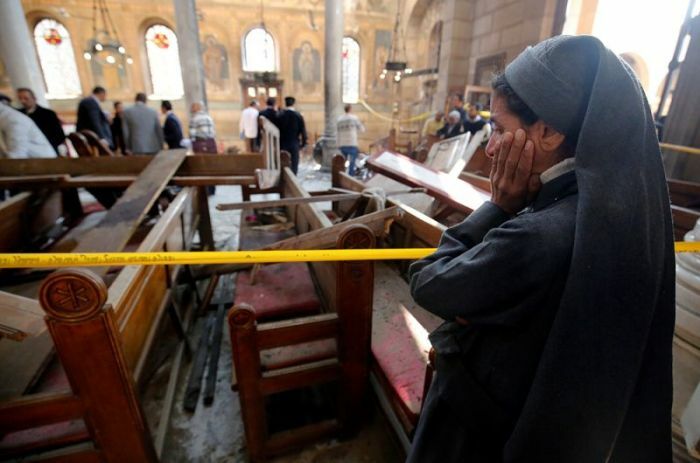 Two of the attacks occurred on April 9, 2017, when churches in Tanta and Alexandria were bombed during Palm Sunday attacks that were later claimed by the Islamic State terrorist group. The bombings took the lives of 47 people and injured over 120 others. Additionally, some were convicted for their involvement in the bombing of the Botroseya Church in Cairo on Dec. 11, 2016, which took the lives of 29 people and injured 47. That attack was also claimed by the Islamic State. The other attack occurred last January when eight policemen were killed and three were wounded during an attack on a police checkpoint in the New Valley. The Egyptian news site Al-Ahram reports that the military court has referred the case to the Grand Mufti, Egypt's highest official of religious law who weighs in with legal opinions and edicts. Earlier this year, the Grand Mufti approved the death sentence of a Muslim man who brutally murdered a Coptic priest in a Cairo street. The convictions of the 36 suspects are subject to appeal. In addition, prosecutors charged three of the defendants with providing other militants with combat training at training camps and with training other militants to manufacture bombs. According to Daily News Egypt, the case involves a total of 48 defendants who have all been accused of joining an illegal terror group and were not only involved in the four attacks but were also planning to launch other violent attacks inside Cairo that would have targeted Christians. Reuters reports that 11 of the 36 are being tried in absentia. An official verdict is expected on May 15. As Coptic Christians comprise about 10 percent of the Egyptian population, the community has faced numerous attacks from radicals in the past year-plus. In addition to the bombings, a number of Copts have been brutally killed in separate attacks and Christians' homes have been burned. Egypt ranks as the 17th-worst nation in the world when it comes to Christian persecution, according to Open Doors USA's 2018 World Watch List. The persecution comes as President Abdel-Fattah el-Sisi has extended an olive branch to the Coptic community and has tried to foster peace and protection for the persecuted Christians. In 2015, Sisi gave a speech before Muslim leaders at Egypt's 1,000-year-old Al-Azhar University where he called for the Muslim leaders to lead a "religious revolution" that embraces peace rather than violence. Sisi has also attended masses during Christian holidays to show his solidarity with the Coptic community. After he came to power in 2014, Sisi personally ordered the rebuilding of dozens of churches that were destroyed by Muslim Brotherhood extremists. "When a law passed by parliament to protect churches was trapped in a maze of bureaucracy and indifference, [Sisi] intervened, ordering it all to be sped up," American religious freedom advocate and informal advisor to the Trump administration Johnnie Moore wrote in an op-ed this week. "Under President el-Sisi, Egypt's religious establishment has also signaled moderation." How Can Western Christians Support Both Israel and Middle East Christians?